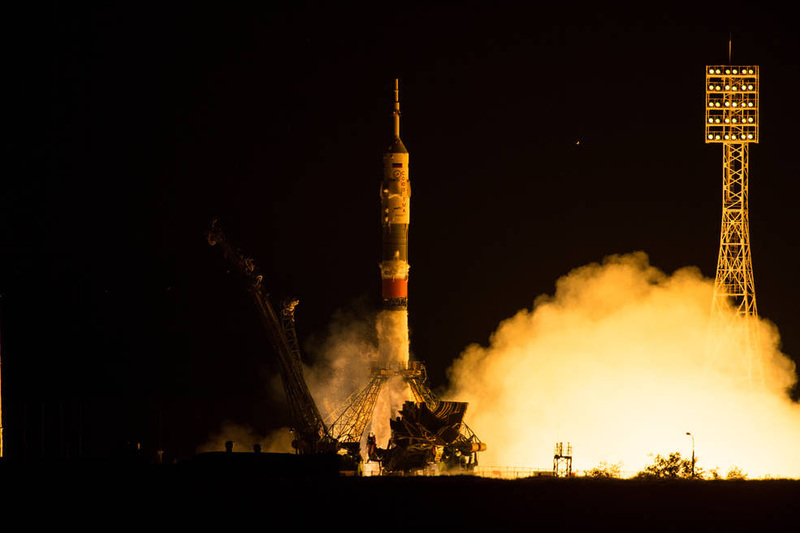 July 23, 2015 – Three crew members, including Kjell Lindgren, joined their Expedition 44 crewmates when the hatches between the Soyuz TMA-17M spacecraft and the International Space Station opened at 10:56 p.m. MDT on Wednesday. 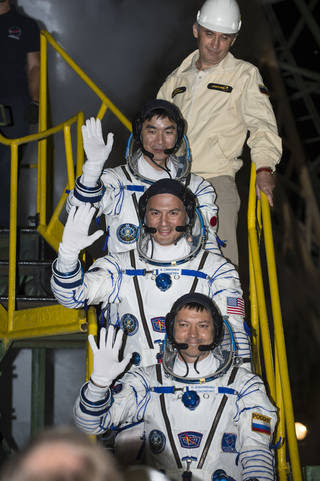 NASA astronaut Kjell Lindgren, Russian Federal Space Agency (Roscosmos) cosmonaut Oleg Kononenko and Japan Aerospace Exploration Agency (JAXA) astronaut Kimiya Yui launched from the Baikonur Cosmodrome in Kazakhstan at 3:02 p.m. MDT Wednesday (3:02 a.m., Thursday, July 23 in Baikonur) and docked at the station at 8:45 p.m., after orbiting Earth four times. Lindgren is the latest in a long line of astronauts with Colorado connections, beginning with the late Scott Carpenter. Carpenter was born in Boulder and was one of America’s seven original astronauts and the second American to orbit Earth. Lindgren was born in Taiwan while his father was serving in the U.S. Air Force during the Vietnam War, and spent most of his childhood in England. Lindgren came to Colorado to study at the U.S. Air Force Academy in Colorado Springs, where he earned a bachelor degree in biology. From there, Lindgren continued his education and earned a master’s degree in cardio-physiology from Colorado State University in Fort Collins. Lindgren received his medical degree from the University of Colorado and began working as a flight surgeon at NASA’s Johnson Space Center in Houston in 2007 before his selection to the astronaut corps in 2009. Beginning this week, Lindgren will use the scientific training he acquired in Colorado to assess the effects of long-term space flight on the human body. NASA must understand those health implications in preparing for a mission to Mars, since such a mission is expected to take about three years. Among Lindgren’s experiments is a study being conducted by a CSU faculty member. Susan Bailey, professor of environmental and radiological health sciences at CSU, is analyzing miniscule changes in the DNA of Scott Kelly, who arrived at the ISS in late March. She is one of only 10 scientists chosen by NASA to measure the effects of space travel on Kelly by comparing his physiology to that of his identical twin brother, Mark, who remains on Earth. When they leave Earth’s atmosphere, astronauts are bombarded by subatomic particles from the sun and other sources. Bailey is studying the impacts of space radiation on chromosomal telomeres, which are akin to the plastic tips on the end of shoelaces that keep the lace from unraveling. Those tips help protect the body from aging and the cancer-causing effects of radiation by holding our chromosomes together. Bailey will also be keeping a close eye on the chromosomes of Lindgren. In addition to providing samples of his blood before and after his mission, Lindgren will be drawing his own blood in space and sending the samples down to Earth via cargo vehicles that resupply the ISS. Lindgren, who graduated from CSU in 1996, did his thesis on how to control the bodily fluid shifts that occur during weightlessness. Reflecting on his time at CSU, Lindgren said his main research interest revolved around the behavior of blood in the body when it doesn’t have gravity pulling it downwards. During space travel, astronauts’ plasma moves upward into the chest and head. Lindgren’s thesis focused on ways to keep more blood in the lower extremities, such as wearing thigh cuffs. Among the things Lindgren learned at CSU was how to properly execute the scientific method. Lindgren joined the Aerospace Medical Association while at CSU. He said that opened up a world of networking opportunities to learn about space physiology. He also took advantage of the opportunity to conduct research at the NASA Ames Research Center in Sunnyvale, California. The arrival of Lindgren, Kononenko and Yui returns the station’s crew complement to six. The three join Expedition 44 commander Gennady Padalka of Roscosmos and flight engineers Scott Kelly of NASA and Mikhail Kornienko of Roscosmos, who have been aboard the complex since March 27. Expedition 44 crew members will conduct more than 250 science investigations in fields such as biology, Earth science, human research, physical sciences and technology development. 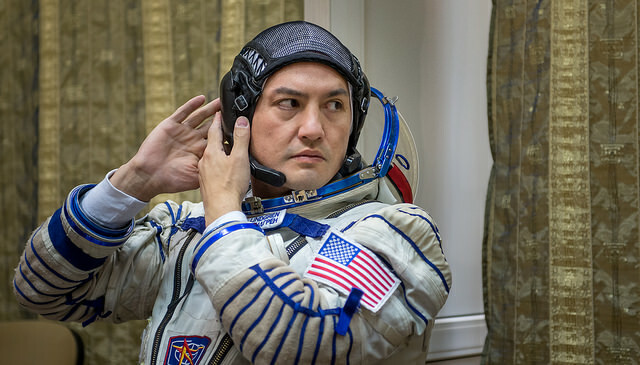 Lindgren, Kononenko and Yui will remain aboard the International Space Station until late December. Kelly and Kornienko are currently conducting a one-year mission to advance understanding of the medical and psychological challenges astronauts face during long duration spaceflight, in addition to developing countermeasures that would reverse those effects.